Note that differentiation relates more to addressing students' different phases of learning from novice to capable to proficient rather than merely providing different activities to different (groups of) students. Differentiation of instruction is often misconstrued. It would be handy to represent differentiation as simply instructional decision making through which a teacher creates varied learning options to address students' diverse readiness levels, interests, and learning preferences. Although that approach is attractive because it simplifies teacher thinking, administrator feedback, and professional development design, it is ineffective and potentially dangerous. To see differentiation as an isolated element reduces teaching to a series of disconnected components that function effectively apart from the whole. The more difficult and elegant truth is that effective teaching is a system composed of interdependent elements. As with all systems, each part is enhanced when others are enhanced, and each part is diminished when any part is weakened. Robust teaching links five classroom elements so that each one flows from, feeds, and enhances the others. Those elements are learning environment, curriculum, assessment, instruction, and classroom leadership and management (Tomlinson & Moon, 2013). This chapter provides a brief overview of each of the elements as they relate to one another and to differentiation. Understanding the mutuality that excellent teachers strive to achieve among the elements also establishes a clear context for an extended discussion of the powerful role of assessment in differentiation. Figure 1.1 provides a flowchart or concept map of the key elements of differentiation. Learning environment refers to both the physical and the affective climate in the classroom. It is the "weather" that affects everything that happens there. Few students enter a classroom at the outset of a new school year asking, "What can you teach me about grammar?" (or the periodic table or cursive writing or planets). Rather, they come with an overriding question: "How is it going to be for me in this place?" The nature of the learning environment for that young person will, in large measure, answer that question. Many years ago, Hiam Ginott (1972) argued that the teacher is the weather-maker in the classroom, with the teacher's response to every classroom situation being the determining factor in whether a child is inspired or tortured, humanized or dehumanized, hurt or healed. In fact, research has repeatedly indicated that a teacher's emotional connection with a student is a potent contributor to academic growth (Allen, Gregory, Mikami, Hamre, & Pianta, 2012; Hattie, 2009). That connection enables the student to trust that the teacher is a dependable partner in achievement. Belief—Confidence in the students' capacity to succeed through hard work and support—what Dweck (2008) calls a "growth mindset"; the conviction that it is the students' committed work rather than heredity or home environment that will have the greatest impact on their success. Invitation—Respect for the students, who they are, and who they might become; a desire to know the students well in order to teach them well; awareness of what makes each student unique, including strengths and weaknesses; time to talk with and listen to the students; a message that the classroom belongs to the students, too; evidence that the students are needed for the classroom to be as effective as it should be. Investment—Working hard to make the classroom work for the students and to reflect the strengths of the students in it; enjoyment in thinking about the classroom, the students, and the shared work; satisfaction in finding new ways to help students grow; determination to do whatever it takes to ensure the growth of each student. Opportunity—Important, worthy, and daunting things for the students to do; a sense of new possibilities; a sense of partnership; roles that contribute to the success of the class and to the growth of the students; expectation of and coaching for quality work. Persistence—An ethic of continual growth; no finish line in learning for teacher or students; no excuses; figuring out what works best to support success; the message that there's always another way to approach learning. Reflection—Watching and listening to students carefully; using observations and information to make sure each student has consistent opportunity to learn and succeed; working to see the world through the student's eyes; asking what's working and what can work better. The teacher has the opportunity to issue an irresistible invitation to learn. Such an invitation has three hallmarks: (1) unerring respect for each student's value, ability, and responsibility; (2) unflagging optimism that every student has the untapped capacity to learn what is being taught; and (3) active and visible support for student success (Hattie, 2012b; Skinner, Furrer, Marchand, & Kindermann, 2008). When a teacher exhibits these hallmarks, students feel the teacher is trustworthy—will be a reliable partner in the difficult and risky work of real learning. That feeling enables the teacher to forge connections with students as individuals. These teacher-student connections provide opportunity for a teacher to know students in a more realistic and multidimensional way than would be the case without such mutual trust. They create a foundation for addressing issues and problems in a positive and productive way. They attend to the human need to know and be known. Teacher-student connections also pave the way for the teacher to build a collection of disparate individuals into a team with a common cause—maximum academic growth for each member of the group. In such classrooms, students work together and display the characteristics of an effective team. They learn how to collaborate. They use their complementary skills to enable each member to capitalize on strengths and minimize weaknesses. They learn responsibility for themselves, for one another, and for class processes and routines. The way in which students experience the classroom learning environment profoundly shapes how they experience learning. Nonetheless, the other classroom elements also profoundly affect the nature of the learning environment. For example, if the curriculum is flat, uninspired, or seems to be out of reach or detached from a student's world, that student's need for challenge, purpose, and power goes unmet and the learning environment suffers. If assessment feels punitive and fails to provide a student with information about how to succeed with important goals, the environment feels uncertain because challenge and support are out of balance. If instruction is not responsive to student needs in terms of readiness, interest, and approach to learning, the environment does not feel safe and the student does not feel known, valued, appreciated, or heard. Finally, if classroom leadership and management suggests a lack of trust in students and is either rigid or ill structured, the learning process is impaired and, once again, the environment is marred. Every element in the classroom system touches every other element in ways that build up or diminish those elements and classroom effectiveness as a whole. One way of envisioning curriculum is to think of it as what teachers plan to teach—and what they want students to learn. The more difficult question involves delineating the characteristics of quality curriculum—in other words, the nature of what we should teach and what we should ask our students to learn. Although that question has no single answer, ample evidence (e.g., National Research Council, 2000; Sousa & Tomlinson, 2011; Tomlinson & McTighe, 2006; Wiggins & McTighe, 1998) suggests that curriculum should, at the very least, have three fundamental attributes. First, it should have clear goals for what students should know, understand, and be able to do as the result of any segment of learning. Second, it should result in studentunderstanding of important content (versus largely rote memory of content). Third, it should engage students in the process of learning. Although nearly all teachers can report what they will "cover" in a lesson or unit and what their students will do in the lesson or unit, few can specify precisely what students should know, understand, and be able to do as a result of participating in those segments of learning. Without precision in what we've called KUDs (what we want students to know, understand, and be able to do), several predictable and costly problems arise. Because learning destinations are ambiguous, instruction drifts. In addition, students are unclear about what really matters in content and spend a great deal of time trying to figure out what teachers will ask on a test rather than focusing on how ideas work and how to use them. Third, assessment and instruction lack symmetry or congruence. What teachers talk about in class, what students do, and how they are asked to demonstrate what they've learned likely have some overlap, but not a hand-in-glove match. From the standpoint of differentiation, lack of clarity about KUDs makes it difficult, if not impossible, to differentiate effectively. A common approach occurs when teachers "differentiate" by assigning less work to students who struggle with content and more work to students who grasp it readily. But it is neither useful to do less of what you don't understand nor more of what you already know. Effective differentiation is most likely to occur when a teacher is (1) clear about a student's status with specified KUDs, (2) able to plan to move students forward with knowledge and skill once they have mastered required sequences, and (3) able to "teach backward" to help students who lack essential knowledge and skill achieve mastery, even while moving the class ahead. In differentiating understandings, teachers are likely to be most effective when they have all students work with the same essential understandings but at varied levels of complexity and with different scaffolding based on the students' current points of development. These more defensible approaches to differentiation are unavailable, however, without clear KUDs. If we intend for students to be able to use what they "learn," memorization is an unreliable method to accomplish that goal. Students fail to remember much of what they try to drill into their brains by rote recall, even in the short term. Further, they can't apply, transfer, or create with "knowledge" they don't understand—even if they do recall it (National Research Council, 2000; Sousa & Tomlinson, 2011; Wiggins & McTighe, 1998). Understanding requires students to learn, make sense of, and use content. It also suggests that the U in KUD is pivotal. Making understanding central in curriculum calls on teachers themselves to be aware of what makes their content powerful in the lives of people who work with it, how the content is organized to make meaning, and how it can connect with the lives and experiences of their students. It also calls on a teacher to create sense-making tasks for students in which they use important knowledge and skills to explore, apply, extend, and create with essential understandings. In terms of differentiation, creating understanding-focused curriculum asks teachers to realize that students will approach understanding at varied levels of sophistication, will need different support systems to increase their current level of understanding of any principle, and will need a range of analogies or applications to connect the understanding with their own life experiences. In terms of assessment, an understanding-focused curriculum suggests that pre-assessments, formative (ongoing) assessments, and summative assessments will center on student understanding at least as vigorously—and generally more so—than on knowledge and skill. In fact, assessments that help students connect knowledge, understanding, and skill will be particularly potent in the learning process. There is a clear link, of course, between understanding and engagement. It's difficult to invest over time in content and ideas that feel inaccessible or estranged from personal experience. Engagement in the classroom results when a student's attention is attracted to an idea or a task and is held there because the idea or task seems worthwhile. Students become engrossed because the task is enjoyable, or because it seems to provide them with the power of competence or autonomy, or because it links with an experience, interest, or talent that is significant to them, or because it is at the right level of challenge to stimulate rather than frustrate or bore them—or likely because of a combination of these conditions. When students are engaged, they are more likely to concentrate, remain absorbed with a task, persist in the face of difficulty, experience satisfaction, and feel pride in what they do. Conversely, lack of engagement leads to inattention, giving up, withdrawal, boredom, and frustration, anger, or self-blame (Skinner et al., 2008). Curriculum that promotes understanding is engaging in a way that drill and rote memory seldom are, and conversely, curriculum that is engaging causes students to persist in achieving understanding. Phil Schlechty (1997) says that the first job of schools (and the second and the third … ) is to produce curriculum that is so engaging for students that they keep working even when the going gets tough, and that results in a sense of satisfaction and even delight when they accomplish what the work asks of them. In terms of differentiation, tasks will sometimes need to be at different degrees of difficulty or linked to different experiences, interests, and talents in order to engage a broad range of learners. In terms of assessment, it's useful to realize that students are less likely to invest effort in assessments that they see as detached from their lives and experiences, or that are at a level of challenge that is out of sync with their current point of development. In addition to goal clarity, a focus on understanding, and the ability to engage students, quality curriculum has one additional characteristic that aligns with a sound philosophy of differentiation: the principle of "teaching up." When designing a differentiated task to address student readiness needs, a teacher must decide on a starting point for planning. Is it best to plan first for the "typical," or "grade-level," student and then differentiate by making some tasks easier? Or perhaps it makes better sense to begin with designing work for students who struggle with particular content and then to enrich the work for students whose proficiency is beyond basic. In fact, a third option is far more powerful on several levels. If teachers routinely began planning student work by developing tasks that would invigorate students who are advanced in a topic or content area and then differentiate by providing scaffolding that enables the range of less advanced learners to work successfully with the advanced-level task, achievement would be accelerated for many other students. Further, "teaching up" has at its core a connection between curriculum and learning environment. When teachers believe unequivocally in the capacity of their students to succeed through hard work and perseverance, it's natural to provide work that complements the capacity of each student to think, problem solve, and make meaning of important ideas. "Teaching up" communicates clearly that everyone in the class is worthy of the best curriculum the teacher knows how to create. Differentiation makes it possible for a broad range of students to step up to the challenge. If teachers strongly believe in the ability of their content and curriculum to improve students' prospects and lives and in the worth and potential of their students, it follows that they would be eager to know how each student is progressing toward achieving important learning goals—and going beyond. Teachers would no more want any of their students to persist in feeling frustrated and anxious or to languish in boredom than they would want that to happen to their own child. Assessment would be as natural a diagnostic process in the classroom as it is in a good medical context. The teacher simply must have a regular and evolving sense of a student's academic progress to plan for that student's academic health. For differentiation to be effective, teachers need to know, for each student, where that student begins and where that student is in the individual journey toward meeting the criteria of the lesson or unit (Hattie, 2012b). In other words, assessment is the compass for daily planning in a differentiated classroom. The remaining chapters in this book explore how assessment guides instruction that is designed to work for a variety of learners. Chapter 2 establishes a foundation for thinking about assessment and differentiation. Whereas curriculum refers to what teachers teach or what students should learn, instruction refers to how teachers teach or how students will experience learning. A number of researchers argue that instruction is more powerful in student learning than is curriculum. Dylan Wiliam (2011) notes, "A bad curriculum well taught is invariably a better experience for students than a good curriculum badly taught: pedagogy trumps curriculum. Or more precisely, pedagogy is curriculum, because what matters is how things are taught, rather than what is taught" (p. 13). John Hattie (2009) reflects, "It is less the content of curricula that is important than the strategies teachers use to implement the curriculum so students progress upwards through the curricula content" (p. 159). Max van Manen (1991) reminds us that the most important pedagogical question a teacher can ask is how a particular learner is experiencing what's being taught. Indeed, instruction is at the core of differentiation because the ultimate goal of differentiation is to ensure that each student has the best possible learning experiences in order to maximize academic growth. (We are not referring to growth defined by standardized test scores, but rather by a variety of indicators of development in knowledge, understanding, skill, engagement with learning, and autonomy as a learner.) Achieving the goal of maximum academic growth, however, is dependent upon effective instructional practices working in concert with an effective curriculum, as well as effective assessment, and classroom leadership and management. In other words, instruction that is effective in moving students ahead from their starting points will (1) benefit from and contribute to a positive learning community, (2) be targeted at helping students acquire and use the specified learning targets (KUDs), (3) be informed by pre-assessment and formative (ongoing) assessment, and (4) necessitate flexible classroom routines and student participation in those routines in a way that accommodates students' varying needs. Sometimes teacher observation, the goals of the day, and assessment information will indicate that the whole class might benefit from the same instruction. In those cases, of course, differentiation isn't necessary. On the other hand, there will be many times when some students are ahead of or behind others in a particular segment of learning, or when students would benefit from connecting learning targets (KUDs) with their particular interests, or when it's sensible to offer students more than one path to accomplish important goals. In those instances, students are well served when teachers address their particular needs as well as the needs of the class as a whole—in other words, when teachers differentiate instruction based on students' readiness, their interests, and their preferred approaches to learning. Readiness is not a synonym for ability or capacity to learn. Rather, it refers to a student's proximity to specified learning goals. A student's actual ability is much like an iceberg. Only a small portion of it is visible; much more lies beyond our view. Nonetheless, we often err by classifying students according to what we perceive to be their ability and teaching them accordingly. That's most often a grievous error. Planning instruction based on what we think is a student's capacity to learn leads us to ask, "What can this student do?" Planning instruction based on readiness guides us to ask, "What does this student need to do in order to succeed?" The term readiness aligns with a growth mind-set—both flowing from and feeding it. Many instructional approaches enable teachers to attend to a range of readiness needs. These approaches include, but certainly are not limited to, the following: tiering, small-group instruction, use of reading materials at varied levels of readability, learning contracts, learning centers, compacting, flexible time spans for work, personalized goals, and use of technology to assist students with reading, writing, or other learning needs. Interest is a great motivator for learning. Interest can refer to a topic or skill that taps into a student's talents or experiences or dreams—an area of current passion for the student. It can also refer simply to ideas, skills, or work that is appealing to a student. The term might also be used to think about new possibilities a student could encounter in the classroom that would be a source of future passions. In any case, students invest more in or become more engaged with that which interests them. An artful teacher helps students see themselves, their lives, their talents, and their aspirations in the curriculum they study. That happens, for example, when a high school history teacher invites students to learn about contributors from many cultures to an event or a time period; when a middle school math teacher supports students in studying the mathematics of music or the science of art; when an elementary music teacher helps students see that music is self-expression; or when a world language teacher guides students in comparing the language of their neighborhood to the language they are studying in class. It happens when a high school teacher shows students the mathematics involved in 3-D structures and angles in skateboard parks so that math is not reduced to a series of operations and algorithms. Students also see their interests in school subjects when a middle school English teacher gives a student "permission" to study theories of dinosaur extinction for an English assignment, even though the focus of the work is science; or when a high school history teacher invites a student talented in art to draw caricatures of key historical figures for display and discussion in the classroom; or when a technology teacher asks students to build the prototype of a machine that can help to solve a problem they care about. Among instructional approaches that help students connect required content with their interests are independent studies, interest centers, anchor activities, the RAFT writing strategy, expert groups, Jigsaws, and authentic assessments. Nearly all people—teachers and students included—have stories about times when learning worked very well for them and times when it was awkward, painful, or hopeless. Learning-profile differentiation seeks to provide learners with approaches to learning that make the process both more efficient and more effective for them. Learning profiles, learning preferences, or preferred approaches to learning are shaped by gender, culture, the environment, biology, and a particular learning context. It is not the case that individuals have just one or two approaches to learning that are a match for them. It is not the case that a person learns best the same way in two different content areas or in two different topics within the same content area. For example, a student who learns the multiplication tables best by saying them orally may learn about latitude and longitude best by drawing or examining maps. Current research (Coffield, Moseley, Hall, & Ecclestone, 2004; Lisle, 2006; Pashler, McDaniel, Rohrer, & Bjork, 2008) and wisdom generally do not support using surveys or questionnaires or other assessments to "determine" a student's learning style or intelligence preference, and certainly do not support assigning a student a particular learning-style or intelligence-preference label, or assigning tasks based on assumptions about learning style. Rather, the goal of learning-profile differentiation should be to create more ways for students to take in, engage with, explore, and demonstrate knowledge about content, and then to help students develop awareness of which approaches to learning work best for them under which circumstances, and to guide them to know when to change approaches for better learning outcomes (Tomlinson & Imbeau, 2013). Teachers and students need to understand that categorizing or pigeonholing people is to both misjudge and limit them. Some of the strategies useful in providing students with approaches to learning that will work for them in a particular context include the following: RAFTs, learning contracts or menus, Tri-Mind, synthesis groups, different work-group options (such as work alone, with a partner, or with a small group), and varied expression options and tools for class assignments, homework, and assessments. Two key principles of effective differentiation related to instruction are flexible grouping and respectful tasks. Flexible grouping stresses the importance of proactive instructional planning to ensure that students regularly and frequently have the opportunity to work with a wide variety of peers. Within a short time, students should work with peers who have readiness needs similar to their own and peers with a variety of readiness points; peers who share their particular interests and peers who have interests quite different from their own; peers who want to approach a learning task as the student does and peers who approach learning differently; randomly grouped peers and peer groupings created by both teacher and student choice. Designed appropriately, these opportunities to work with many age-mates are important in broadening students' awareness and appreciation of their own strengths and needs and the strengths and needs of others. Flexible grouping also keeps students from perceiving themselves and others as "bluebirds, buzzards, and sparrows," while it helps teachers "audition" their students in a variety of learning contexts. The principle of respectful tasks is also central to the success of differentiation. This directs us to ensure that each student's work is as interesting and inviting as every other student's work. It reminds teachers that every student should regularly encounter tasks that reflect the teacher's belief that the student is worthy and capable of grappling with and applying important ideas and skills—that the student is a critical thinker who can bring her skills to bear on addressing difficult issues and solving complex problems. Five components of instruction can be differentiated: (1) content—what a student needs to learn or how the student will gain access to the knowledge, ideas, and skills; (2) process—how the student will come to master and "own" the knowledge, ideas, and skills; (3) product—how the student will summatively show what he has learned; (4) affect—the climate that encompasses the learning and interactions among students and teacher; and (5) learning environment—the personal, social, and physical arrangements in the classroom. All of these elements can be differentiated to address students' readiness needs, their interests, and their learning profiles or preferences. Figure 1.2 provides an example of each of the five components modified to address each of the three areas of student variance. An elementary teacher uses digital video images of geological phenomena to support understanding of students who have no experience with the phenomena and who need to develop academic vocabulary related to the phenomena. A biology teacher uses athletic teams, families, and rock bands to illustrate the concept of symbiosis. During a poetry unit, a teacher finds more students are engaged when she discusses the creative aspects of poems and how the poems connect to students' lives (practical aspects) along with analytical aspects. Based on pre-assessment information, a primary teacher begins a unit on telling time by having some students work with telling time by the hour and half hour, some by telling time to five-minute intervals, and some by telling time to the minute. Students look for examples of symmetry in objects they use at home or in hobbies and create an exhibit of their objects with an explanation of how they use the objects and why the objects represent symmetry. Primary students must learn how Earth's rotation and revolution create day and night and season. To begin the unit, the teacher illustrates the concept of rotation by having students stand and rotate, find and explain objects that rotate, sing about rotation, and draw something that rotates. A middle school teacher provides all students with models of effective student products from prior years to help them analyze what quality work looks like. Although all of the examples demonstrate proficiency with KUDs, students who are more advanced with the content examine models at a higher degree of sophistication. High school students studying Robert Frost's "Road Not Taken" use the life of a famous person or well-known character from movies or literature to demonstrate parallels between the events in the poem and in the life of the person they chose. Elementary students use meteorological data to make a forecast for the week ahead in their town. All students must predict the weather and explain their prediction. They may write and illustrate the forecast for the local paper, present the forecast for TV, or create a weather map that depicts their forecast. An algebra teacher watches students for signs of frustration as she explains complex concepts, and she stops for peer debriefing followed by Q&A when she thinks students feel they are getting lost. A secondary teacher realizes several students in her classes resist challenging tasks. Early in the year, she makes sure to stress that evidence of persistence, seeking help, and revision are important, and she both encourages and acknowledges student contributions of effort to their success. Sammy has great difficulty sitting still for more than a few minutes at a time and gets tense and inattentive as a result. The teacher has assigned him two seats on opposite sides of the room and has worked with him on when and how he can go from one seat to the other to move during whole-class lessons. A middle school social studies teacher has created four room arrangements and posted four corresponding seating diagrams on a bulletin board to allow flexibility in presentation and interaction. Students all know which furniture to move and how to move it to go quickly from one configuration to another. An elementary teacher has posted "help cards" in several places in the room so when students are working independently, they can easily find reminders about things such as how to save work to a folder on the computer, the elements of haiku, or rules for basic punctuation. A classroom has portable carrels that students can place on their desks if movement of other students distracts them while they are working. There are also headphones and earplugs students can use if they are easily distracted by small-group conversations when they are working alone. Instruction in a differentiated classroom is, not surprisingly, tightly interconnected with the other four classroom elements (curriculum, assessment, learning environment, and classroom leadership/management). It should be guided by the curriculum's KUDs and shaped by pre- and formative assessment. When instruction is a good fit for the variety of learners in the classroom, it influences the environment in a positive way, making it a safe place for the risk of learning. When instruction is ineffective for some or many students in a classroom, the environment becomes negative and deflects student attention away from learning and toward self-protection (Sousa & Tomlinson, 2011). Responsive instruction also contributes to community as students learn to appreciate the growth exhibited by their peers and the effort that fuels the growth. The component of classroom leadership and management, as we'll see in the next section, helps students understand the need for differentiation, contribute to its philosophy, participate actively in the success of its routines, and support one another and the teacher in making the classroom work for everyone who invests time there. It goes without saying that when 20 or 30 or 40 young people gather in a limited space, the opportunity for some degree of bedlam is quite real. It also goes without saying that classrooms are not good places for any degree of bedlam. Not only can students not learn in that context, but a teacher can't maintain sanity, either. The bedrock questions asked by novice teachers, then, typically cluster around how to "manage" students. Even many veteran teachers never quite lose the niggling fear that they could lose control of the classroom in an instant. As teachers, we often think of classroom management as a synonym for control. That approach, of course, positions a teacher in an adversarial role with young people whose nature is to move about (sometimes clumsily) and to speak at inopportune moments (sometimes too loudly). There is something in the makeup of human beings—teachers included—that resists being "managed." A better way to think about creating a classroom in which teaching and learning can proceed predictably and productively is to see this aspect of the teacher's job as twofold—leading students, and managing processes and routines (Tomlinson & Imbeau, 2013). Although we humans resist being managed, we are amenable to becoming part of an endeavor that we perceive to be meaningful and beneficial. Leading in a differentiated classroom suggests that a teacher has a vision of a classroom where the welfare of each student is paramount, where members come together as a team to achieve important goals—a community designed to support the maximum development of each individual and the group as a whole. When a teacher can articulate that vision to students of any age, help them co-construct parameters by which such a community would operate, and systematically work with them to implement the vision, students understand and own the game plan in the classroom. "Let's work together to create a place where learning works for all of us" is a far more compelling invitation for most learners than "Please sit still and participate only upon invitation." Such a visionary approach doesn't ensure that all students will function with maturity and equanimity all of the time, of course. What it does provide is a respectful, optimistic, growth mind-set–oriented way for a teacher to work with students to create an environment that balances structure and flexibility to accommodate all kinds of learners. Flexible classroom management not only is essential for differentiation, but also is an imperative for a classroom in which students are expected to engage with intellectually challenging ideas and to be thinkers, problem-solvers, and collaborators (LePage, Darling-Hammond, & Akar, 2005). Thus curriculum focused on engagement and understanding as well as "teaching up" requires a flexible approach to teaching and learning. This approach also creates an environment that provides affirmation, challenge, and support to a full range of learners, creating a safe place for those students to learn. It exemplifies the growth mindset of teachers who believe in the capacity of their students not only to learn what's necessary for success, but also to work responsibly to support that success. Further, formative assessment is of little use if rigid classroom management curbs a teacher's willingness to provide learning options that assessment data indicate are necessary so that students can take their particular next steps forward in learning. Student centered—because teaching is all about where a student is on the journey from novice to competent to proficient. Knowledge-centered—because there must be clear and important knowledge so students can make connections and relationships among ideas. Assessment-rich—to better understand where students are throughout the journey in order for the teacher and students to know where to go next, so that each student can move ahead from his or her starting point. Community-centered—because there is no one way from novice to proficient, teachers and students need to share and learn from one another, share the trials, tribulations, and triumphs of how each person progresses, and share the relevance of what the community's members are aiming to learn. These are also attributes of effectively differentiated classrooms in which learning environment, curriculum, assessment, instruction, and classroom leadership and management work in concert with the goal of helping each learner progress as far as possible with powerful learning goals. In the remainder of the book, we focus on one of these interconnected elements—assessment. It's important to recall, however, that the elements must work together in ways that both research and practice reveal are beneficial to students' learning and their development as learners. 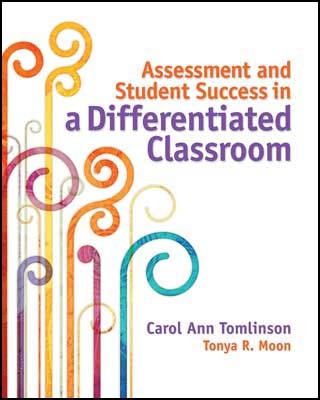 The focus of this book is differentiation and assessment. If you would like to read more about differentiation as a whole and about the role of the various elements as discussed in this chapter, see the suggested books in the appendix.